“It’s rarely been my experience as an interviewer, to find common personal ground with a subject. The reporter’s role, after all, is to extract a story at a “professional distance.” But quickly, Dr. Mike Gilmour and I began a spirited discussion when we discovered a common shared passion,” Scott Mercer. “We ran Boston this year,” Dr. Mike Gilmour declares proudly. His audience of one is sincerely impressed. And why not? The annual Boston Marathon represents the pinnacle of any runner’s competitive ambition. Winning the storied race is never a realist’s goal, with elite international runners sprinkled liberally among the field. Simply qualifying marks a world-class achievement. Earning a place among Boston’s throng of starters demands documenting a time, from a previous marathon, below three and a half hours. Mike and his running partner, Dr. Tony Brown, accomplished the feat by recording personal-best times last fall in Picton, fulfilling a long-time shared goal which once seemed more of a pipe-dream. 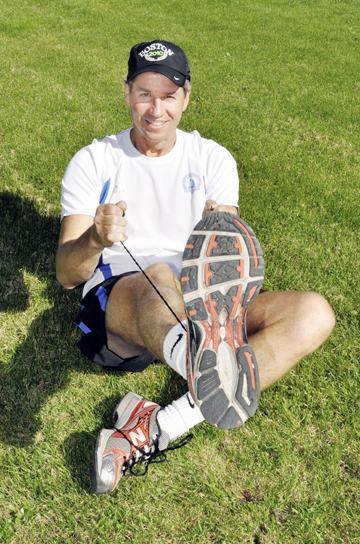 Now 47, Mike targets completion of ten marathons before returning to more recreational distances. He’s philosophical about the demands of his training program. Mike brings the same tenacious dedication to his medical pursuits. Toronto born and educated, Port Perry may have begun as only a dot on Mike’s provincial map. But a short posting, as part of his two-year internship, convinced Mike and his wife, Janice, that it was a perfect fit. Port Perry’s small-town atmosphere, removed from the challenges of big-city life, also suited the couple’s future plans. Now 20 years old, elder son Ryan sits midway through his second year at Waterloo with an eye towards his own medical career. Like his 18 year old sister, Kirstie, Ryan is studying kinesiology, hinting his future may lie in optometry. Kirstie, on the other hand, hopes to put her undergraduate degree from St. Francis Xavier University to a different end, pursuing a career as a teacher. Youngest son, Mack, according to Dad, hasn’t yet chosen his calling, but as a Grade 10 student, there’s still lots of time to experience and decide. Mike witnessed, first-hand, what might arguably be Port Perry’s most dramatic medical event. When a local bank was robbed 15 years ago, and a police officer and bank manger were shot, Mike was the on-call physician. “It’s a night I’ll never forget,” he says, wincing ever so slightly at the memory. “Ambulance dispatch warned us to expect multiple gunshot wounds. Right away, we mobilized a number of off-duty doctors and nurses to assist, and fortunately, all the victims survived. Mike recently expanded his scope to include a share of the local coroner’s role. He’s also begun using his now-veteran knowledge for humanitarian applications. “Dr. 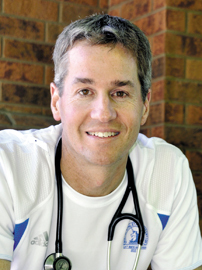 (Tony) Brown is the Medical Director for ‘Feed the Children,’ which provides care in stricken regions of the world. He encouraged me to join their team.” His acceptance has taken Mike on recent missions in Nicaragua and El Salvador. “We were the first medical team into some coastal communities which had been ravaged by mudslides. We visited five communities in seven days, providing food and clothing as well as medical care. Janice joined me, assisting with distribution. The experiences also touched him on a personal level. Mike also contributes to Port Perry’s role as a teaching hospital. The rewards of that work, he says, go both ways. Twenty years on, and now Chief of Port Perry’s ER, Mike carries forward the community-minded philosophies taught to him in training by Drs. Cohoon and Allin, for whom he reserves high praise. It’s a career far from its “marathon” finish line.